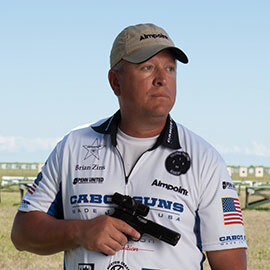 Pro shooter and DFX Pro Staffer Brian Zins is inarguably one of the best shooters in the world. His career has spanned 25 years, from the Marine Corps, the NRA, private security contractor, to multiple national shooting titles. He knows pressure and he knows what it takes to win. I’m Brian Zins and I am from Poland, Ohio. I’ve won 10 national shooting championships and that pressure never really got to me. The gyro for me was a real life saver I had actually developed a severe case of shooters elbow (aka tennis elbow) a few years back and I took off after the shooting season of 2010. I didn’t shoot for about 18 months up until this shooting year and the only reason I was able to come back as strong as I was is because of that little device, the DFX Powerball. I was able to get my grip strength back I got rid of the pain in my forearm from shooting. I been doing it for a long time and i was really worried it was going to be the end of my shooting career but it was a saving grace. I’ll tell you what the DFX Powerball really helped me out this year and brought me back and actually won me my 11th national championship. I have a DFX Platinum Powerball where you can actually get a visual simulation and visual effect that you can actually pick up and see, the faster you get going the brighter the light gets going and I’ll tell you what that power that you’re feeling back, is amazing! I mean there’s nothing I’ve ever done for forearm or grip training before that…that quick I actually start to get a little bit of that burn. You can just feel the blood coursing through the forearm into the hand and no kidding in just a couple of minutes you start getting a good burn, a real workout like you’ve been doing wrist curls all afternoon. Brian Zins was raised in Canfield, Ohio. He grew up playing baseball and also learn how to juggle at a young age, both of which he credits for his good hand-eye coordination in shooting. After graduating from high school, Zins went to college to study Law Enforcement. However, he decided to join the United States Marine Corps in 1988. After completing the Recruit training program at Paris Island, South Carolina, Zins attended the Military Police School at Lackland Air Force Base in San Antonio, Texas. During that time, he received the Top Gun Award for having the highest qualification score with the M1911 pistol. After retiring from active duty in the Marine Corps in 2008, Zins has worked as National Manager of NRA Pistol Programs in the Competitive Shooting division. He also works as an independent security contractor. Zins also started his own line of ammunition called Gunny Zins Ammo. In 2011, he was hired by Cabot Gun Company as spokesman and ambassador. In 2011, Zins appeared in the second season of History Channel’s marksmen competition Top Shot. During the first half of the competition, Zins competed as part of the Red Team. His team ended up winning six challenges, and Brian was never nominated for elimination during that period. During the final half of the competition, Zins won three of the last individual challenges before the final. In the final, he lost to Chris Reed.